One of the biggest golf names to ever play out of Central Illinois, Ruth More Enger, a former Pekin resident, was perhaps the state's most skilled woman golfer in the mid 1940's and early 1950's. Since winning her first club title in 1935, she has participated in local golf activities in each of the many communities in which she has lived. Warming up for her brilliant career by winning the Peoria City championships and Mt. Hawley Country Club Championships in 1941-42-43, she won six state amateur titles between 1945 and 1954 while playing out of the Pekin Country Club. 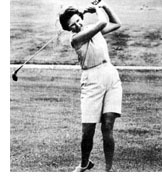 Later moving around the country with her husband, a U.S. Navy officer, she won championships in Norfolk, Virginia; the U.S. Navy's Sewell Point Country Club; Yucca Valley Country Club in Yucca Valley, California; the Marine Base at Quantico, Virginia; city of Coronado, California; the Marine Recruit Depot in Beaufort, South Carolina; the Navy-Marine title in Oahu, Hawaii; four titles in Napa, California and four more in Yucca Valley including consecutive wins from 1988 through 1991. Ruth and her husband, now retired, are residents of Yucca Valley, California, where she is the current club champion at the Blue Skies Country Club. Front Row: (from left) Jim Haines, Sam Durst, Rod Andrews. 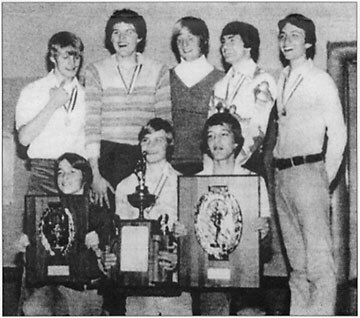 Second Row: (from left) Mark Kissee, Dan Harlan, Coach Tom Meyers, Darryl Dorich, Nick Reinhart.